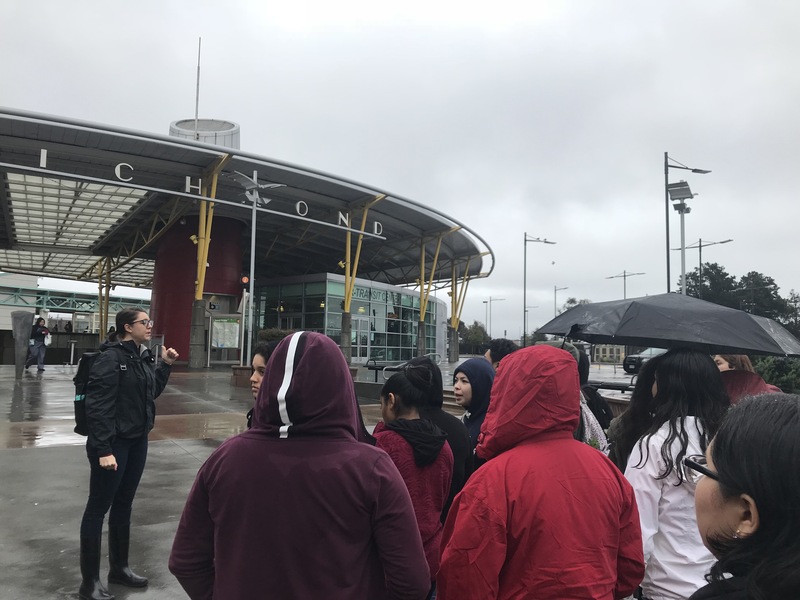 On a recent rainy and windy spring morning, Richmond High School Health Academy sophomores ran to the bus to beat the rain. Ms. Vickery, with the help of some of her students, carried packed box lunches. Myrna, the Y-PLAN Regional Specialist, led the students onto the bus, reminding them what to observe at the sites they were headed to visit. Their top priority: to consider the way in which food circulates and becomes a part of the community. Their first stop: Urban Tilth’s AdamsCrest farm. Upon arrival, Urban Tilth’s farm appeared to be a green space filled with patches of vegetation and mulch. Greenhouses and recycled containers held out of season crops and seedlings for the next harvest. Students followed Adam Boisvert, Urban Agriculture Institute Program Manager, as he spoke about the importance of having such a space in an urban setting like Richmond. Although we were only two miles from Richmond High, this was the first time many of the students had visited a farm in the lives. Cabbage and lettuce lea ves were passed around, and students snapped photos at things they normally didn’t notice at the grocery store. 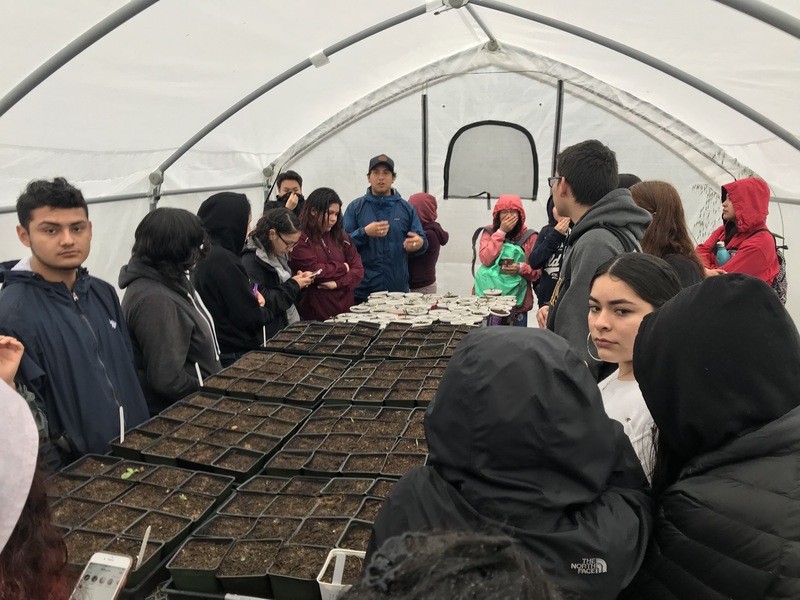 Adam led them into a greenhouse and began talking to the students about the importance of education about agriculture within their communities, and specifically about the need for residents to know about the introduction and duration of large scale systems at the local level. One such example of a large scale system of farming at the local level is Urban Tilth itself, due to its resemblance to large scale rural farms. Urban Tilth could also be seen as an example of equity in a capitalist system. One of the program’s goals is being inclusive in who the food of the farm goes to. Inclusivity is supported by providing boxed organic foods at different prices for a range of family incomes. Adam also shared that the farms they run are creating jobs for local residents, especially youth. Students began asking questions about the food production system and the effects of food transport. They soon realized that having more local food production could reduce pollution and potentially even climate change. At the end of the tour, students explored the rest of the farm and dug in to help pick a hundred pounds of turnips. The second stop was the Downtown Richmond business district and neighborhood. 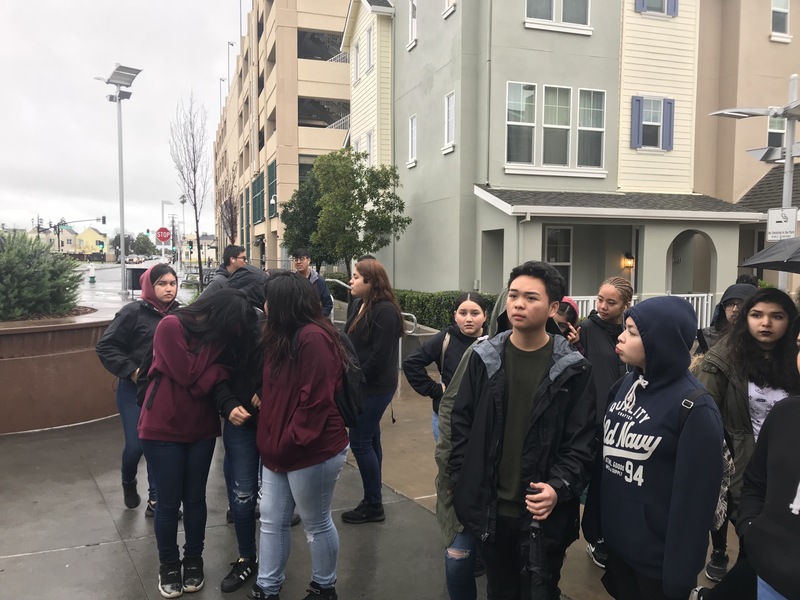 The bus dropped students off at an affordable and mixed-use housing development, just one street shy of the Richmond BART. Mixed facades and colorful wooden textures surround the residential plaza. The Richmond Main Street Outreach Coordinator, Alicia Gallo, joined our group and led the students on a tour of Macdonald Avenue, a historic street of the Downtown Richmond community. Students were asked to map the food access and opportunities they noticed in the downtown neighborhood, while Alicia provided context about the history as well as future plans for that area. The first stop on this tour was the empty retail space owned by BART, located on the first floor of their large station’s parking lot structure. These vacant store spaces would be eventually leased for coffee shops and grocery stores. Further down Macdonald Avenue is the first sit down restaurant to have opened in downtown in over a decade: Your Way Pizza. Alicia discussed that this street once had the vibrant main street scene of the 1940s, and how it became a desolate city center today, as the Hilltop Mall pulled shoppers off its streets and out of the city center. The mission of Richmond Main Street is to bring back that vibrant city center with the help of Richmond’s community, business owners, and youth. Half-way through the tour students found themselves standing near two large empty city blocks with no shops or buildings. Alicia informed them about a new development that would take place on those two lots. The development would be a mixed-use housing building for people with low- and high-incomes, with the goals of creating not only an inclusive community, but a community that supports one another. Students then walked a few blocks to Kaiser Permanente Richmond Medical Center, where a pop-up farmers’ market takes place weekly. The final stop of this half mile walk was a small park on the corner of Harbour Way and Macdonald Avenue. There Alicia invited students to become part of the committee for youth to make decisions on the future events and development in this Richmond neighborhood. After that, students had a few minutes to explore the neighborhood in smaller groups and were quickly faced with the challenge of trying to finding health food options for their own lunch for the day. Although there is a large grocery store and a few small restaurants along Macdonald Avenue, most students ended up purchasing fast food (burgers and tacos), as it was the most affordable options for their budget. The third and last stop of the field trip was the Food Bank of Contra Costa and Solano. There the students met Larry Sly, the Executive Director of the Food Bank. 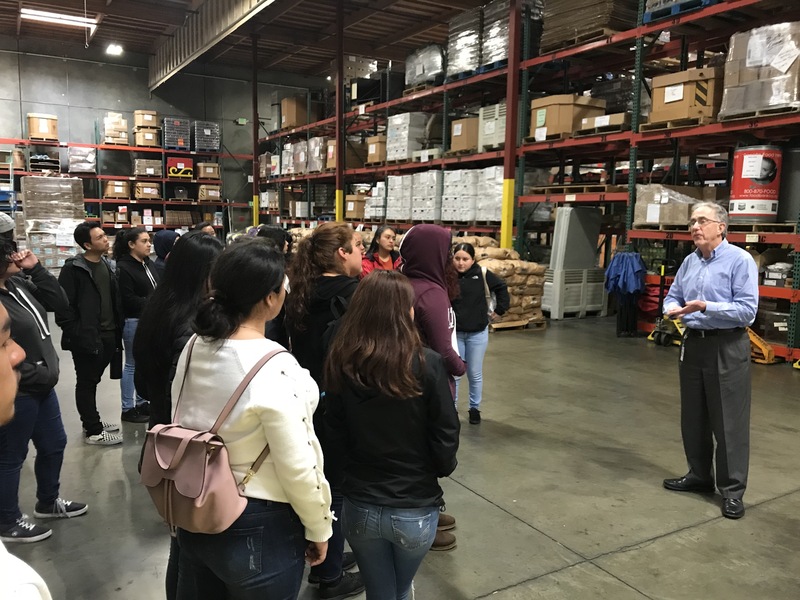 He led the tour of their warehouse facilities and explained to the students the process they use to acquire donated food and redistribute it across Contra Costa County. The large warehouse where the food is kept has tall shelves of canned and non-perishable foods. Later students shared that they were expecting to see more produce at the Food Bank, but learned that fresh produce has to be distributed quickly or it begins to rot, so this type of food is not kept in the warehouse for more than a day. Before leaving the Food Bank students had time to do a S.W.O.T. Analysis, thinking about the strengths and weaknesses of the programs and sites we visited and the opportunities and threats impacting their community. 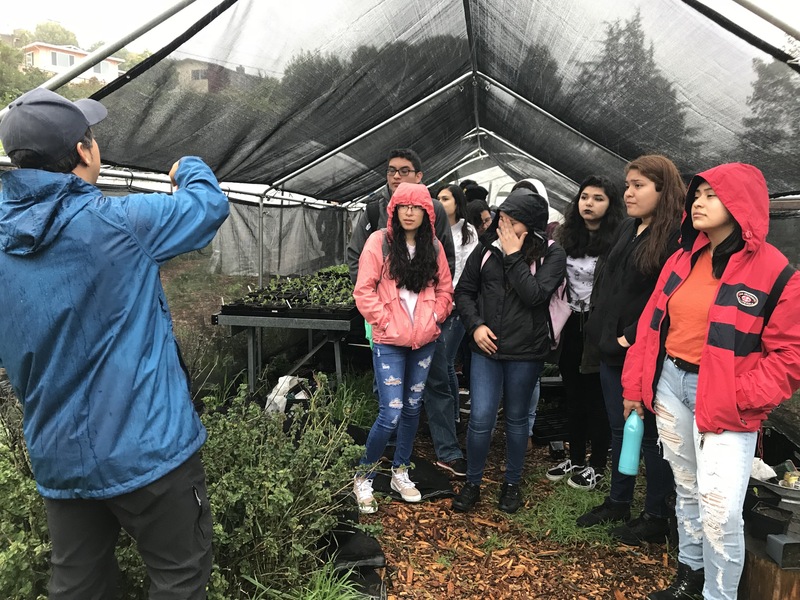 By the end of the day, students had learned about innovative urban farming strategies, experienced the challenges of accessing healthy food first hand, and were able see the “behind the scenes” of the large scale production of distributing food countywide. Students arrived back at school ready to brainstorm solutions, using what they had learned and experienced, to address Richmond’s biggest food access challenges and to make its most vulnerable residents food resilient.